Filipinos will enjoy two national holidays and two other special non-working days as the year 2013 comes to an end. The first pair of holidays will be on December 24 (Christmas Eve) and December 25. These days fall on Tuesday and Wednesday, respectively. This is stipulated in President Benigno Aquino III’s Proclamation 459, which he signed last year. Click this link to read about Proclamation 459. The specifics for the pay rules are discussed in the graphic below. Please click the image to enlarge. Now, notice that December 23 is sandwiched between the weekend and the two Christmas holidays. Is it possible for employees not to report for work on those days and still be entitled to the holiday pay? Yes, according to the Department of Labor and Employment (DOLE). 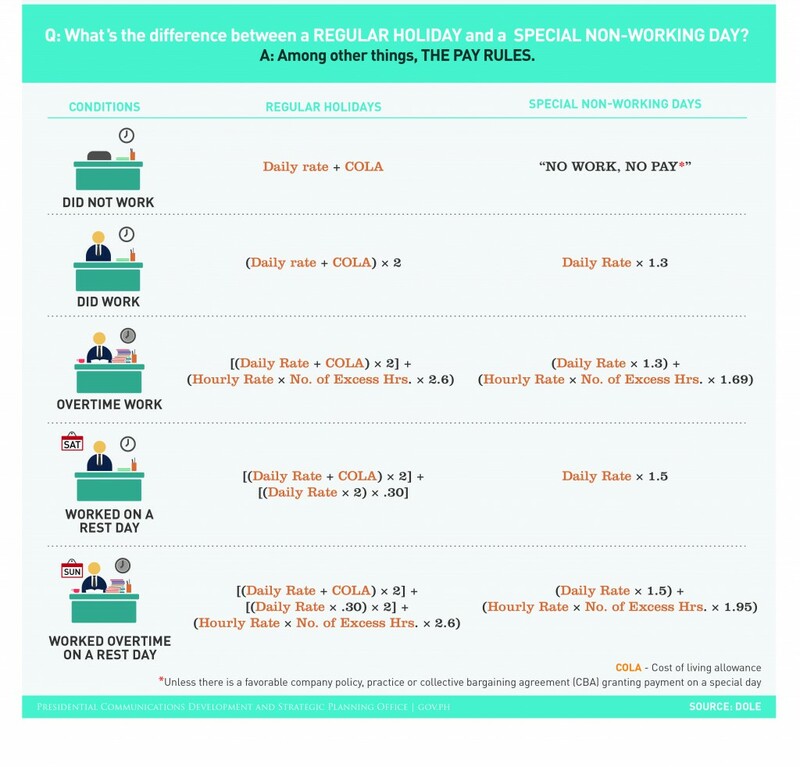 DOLE’s Statutory Handbook on Workers’ Statutory Benefits (2012 edition), stipulates that workers must be entitled to a holiday premium if they are present or is on leave of absence with pay on the work day that immediately comes before the holiday. Therefore, if you plan to have a day off on December 23 as well, better file a leave now. Read the said DOLE handbook here. This entry was posted on Friday, December 13th, 2013 at 9:06 am	and tagged with christmas day 2013 holiday, december 23 2013 holiday, december 23 2013 holiday philippines, december 23 2013 philippine holiday, december 24 2013 holiday, december 24 2013 holiday philippines, december 24 2013 philippine holiday, december 25 2013 holiday philippines and posted in hodgepodge, holiday announcements, philippines. You can follow any responses to this entry through the RSS 2.0 feed.